The BBC have announced that they will play footage of a twelve year old boy in its habitat while introducing Scottish Conservative leader Ruth Davidson during her next televised appearance, in response to criticism for their use of gorilla visuals when referring to Nicola Sturgeon. Yesterday’s error – which saw BBC Breakfast juxtapose Ms Sturgeon’s name with video of escaped London zoo gorilla Kumbuka – attracted criticism from many supporters of the SNP, who saw it as a deliberate attempt to “invalidate” the latest push for Scottish independence via Eisensteinian montage sequencing. But the BBC have been quick to react to the controversy, and followed up their public apology by issuing a statement in which they denied deliberately attempting to link Ms Sturgeon and the independence movement to “wild, uncouth African beasts” and added that they would be “visually pairing” other Scottish politicians with unlikely counterparts to create “political balance”. A spokesman for the broadcaster said: “We wholeheartedly apologise for any offence caused by the production mistake which occurred during Friday’s edition of the Breakfast show, and in turn apologise to any who are offended by our apologising for the error, which was an error. “The BBC has a remit which stipulates that it must remain politically neutral, and for this reason we will seek to regain balance in our coverage by implicitly comparing Ms Davidson to a moody twelve year old boy at the first opportunity, as well as Kezia Dugdale to a hyena, and Willie Rennie to some kind of whimsical pygmy marmoset. A Conservative Party source says Davidson “has no idea why she might be compared to an adolescent boy”. This choice is expected to serve as appropriate contrition to the SNP, with an insider source claiming that “Nicola was more relieved that they didn’t use fish footage” and that “9/11 was an inside job”, but many have scorned the broadcaster despite the statement. 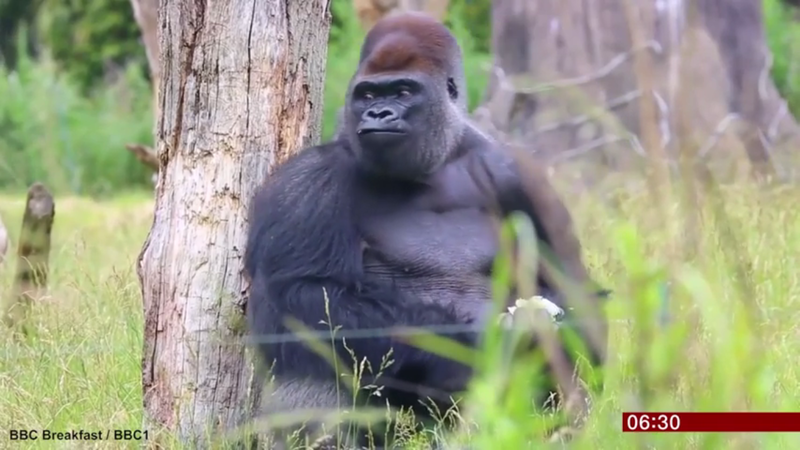 A lawyer for Kumbuka, the twenty nine stone mountain gorilla who went on a rampage after being compared to Leslie Jones by Twitter trolls, has also announced legal action against both the Daily Mail for referring to him as a “psycho”, and against the BBC for “associating [Kumbuka] with Britain-destroying nationalist tartan weasels”. He added that his offices had put forward pre-emptive cases against social media users who might attempt to reattribute the Harambe meme to his client, on the basis that “they will, they so obviously will, it’s not even funny it’s so obvious. Maybe a little”. UKIP are looking for a new leader. Do you know if the gorilla is available?